The Crash Reel hits The UK this Autumn and is the story of Kevin Pearce's traumatic brain injury after an accident whilst training for the 2010 Olympics. Kevin is an Olympic snowboarding hopeful, thought to be a decent rival to gold-medalist Shaun White. However, Kevin has a terrible fall on the half-pipe that leaves him in a coma. When he finally awakes, Kevin is a brain injury survivor and this is his story. The Crash Reel combines breath-taking action footage from years of archives with the story of Kevin Pearce's accident, time in a coma and then rehabilitation after his brain injury. The story is as much the family's as Kevin's, and we watch them wrestle with their feelings as he wants to return to the sport that has put him in this position, even after being told that even a small blow to the head could kill him. The Crash Reel is directed by twice Oscar'-nominated filmmaker Lucy Walker (Devil's Playground, Blindsight, Countdown to Zero, Waste Land, The Tsunami and the Cherry Blossom). Take a look at the trailer for Crash Reel, which came out in October in cinema's in Ireland and the UK. Julian Ball, Pro Skier says "I've just watched it. It's such an emotionally inspiring film - sad but also uplifting. It highlights the importance of safety and how dangerous these sports can be. Kevin Pearce wasn't far off making that jump and his accident had so much impact on so many people's lives: it's taken the snow sports community by storm. It brings to light all that you would go through if you had an accident like this and shows how serious the consequences can be." Katie Blundell, a professional Snowboarder from the UK says, "No, but I would like to. It makes you think about everyone else around me who would have their life changed if something happened to me." 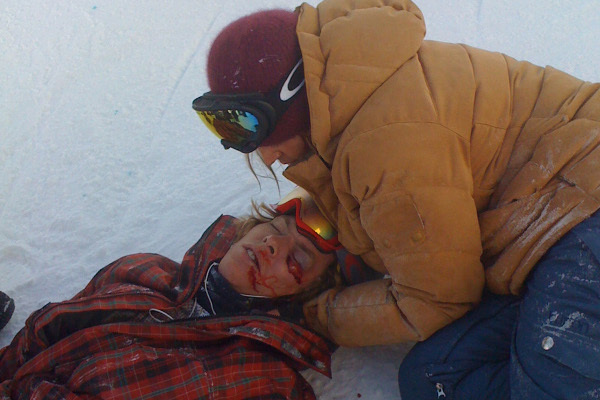 Billy Morgan, No.2 World Stopestyle Snowboarder understands the reality of a bad fall but has not watched Crash Reel, "To be honest, I didn't want to watch it, I tend to put stuff like that into the back of my mind. It's depressing to think what could go wrong. We spoke to the Pro's about Freeze Festival 2013, their safety tips and good luck rituals before a competition, read Pro's On The Slopes.